BELGRADE — The remains of Queen Aleksandra, wife of the last Yugoslav monarch Petar II Karađorđević, arrived from Greece to Belgrade on Thursday afternoon. 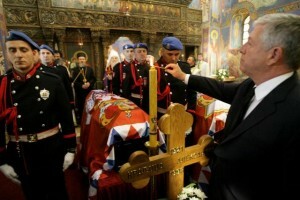 The coffin, accompanied by members of the royal family, was greeted at the Belgrade airport by Special Adviser to the Serbian president Oliver Antić, Greek Ambassador to Serbia Demosthenes Stoidis and Serbian Orthodox Church Bishop Atanasije Rakita. The remains will be transported to the Royal Chapel of St. Andrej (Andrew) the First Called in Belgrade, where the remains of Petar II and his mother, Queen Marija, also arrived recently. The memorial service for Queen Aleksandra will be officiated by Serbian Patriarch Irinej. Queen Aleksandra was the daughter of King Alexander of the Hellenes and Princess Aspasia of Greece and Denmark. She was born in Athens on March 25, 1921 and died in Britain, on January 30, 1993. The queen was previously buried at Tatoi Palace Royal Cemetery near Athens. Queen Aleksandra married the last Yugoslav monarch in Britain in 1944. She was the mother of Crown Prince Aleksandar Karađorđević. King Petar II, his mother Queen Marija and his wife Queen Aleksandra will be given a state funeral at the Royal Mausoleum, Church of St. George, on the Oplenac Hill in Topola, on May 26. More than 2,500 guests from across the world, including representatives of the royal families of Great Britain, Greece, Spain and the Japanese imperial family have announced coming to attend the funeral. The Royal Chapel in the Royal Compound in Belgrade will be open for visitation on Saturdays and Sundays, from 10 a.m. to 2 p.m., until May 26.